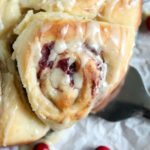 Use up leftover cranberry sauce in the best way possible: these cranberry sauce breakfast rolls can be made the night before and baked in the morning! Happy night before Thanksgiving! I hope it finds you relaxing with friends and family, not stuck in an airport, and enjoying all the food and drinks before the big day. We flew down to Florida this morning to visit Brian’s great aunt and uncle (they’re both over 90! ), and although we had to get up at 3am to get here, we couldn’t be happier to be enjoying the sun and getting away from wintry Chicago. We’ll be helping to host Thanksgiving at a beautiful condo on the beach, and Brian’s mom Colleen and I will be in the kitchen all day tomorrow. I can’t wait! We’re going to try spatchcocking a turkey rather than doing a normal roast…so cross your fingers for us. Before we left, though, we attended a Friendsgiving this past weekend with some of our friends from college. It’s always fun to see what people come up with and the different variations they take on the traditional dishes. One of my responsibilities was cranberry sauce, and we had quite a bit left over – so of course I had to think of a creative way to use it. 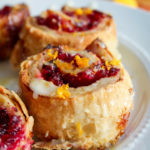 I really liked the cranberry orange rolls I made last year, but those use raw cranberries rather than cranberry sauce. I wanted a way to use the sauce! 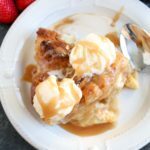 So, I decided to experiment, taking my favorite cinnamon roll recipe (coincidentally, the most popular recipe on my site!) and using the cranberry sauce as the filling instead of the cinnamon/sugar/butter mixture. 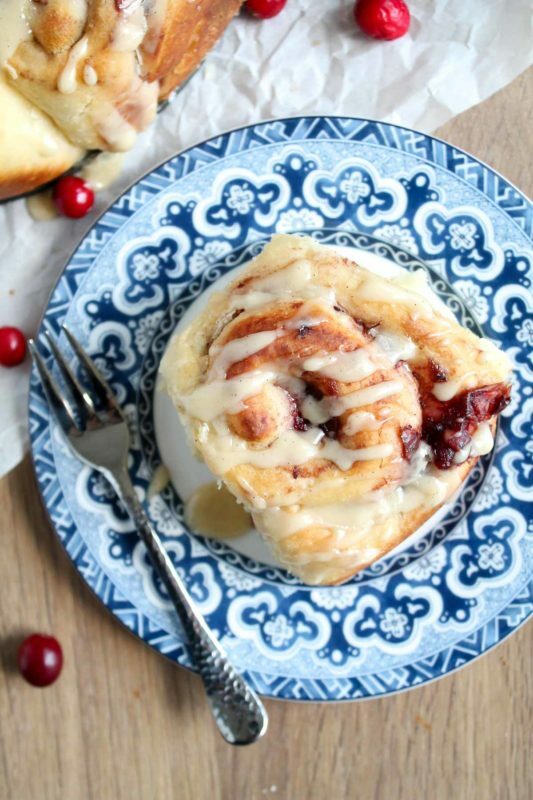 What could really go wrong when cinnamon roll dough is involved, right? Answer: nothing. It was perfect. 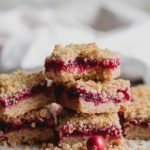 Our apartment smelled amazing as they were baking, and I couldn’t get enough of the flavor! I took these to the office on Monday and let’s just say, they went over well. You can’t go wrong with these little guys. I decided to top them with an easy vanilla orange glaze. 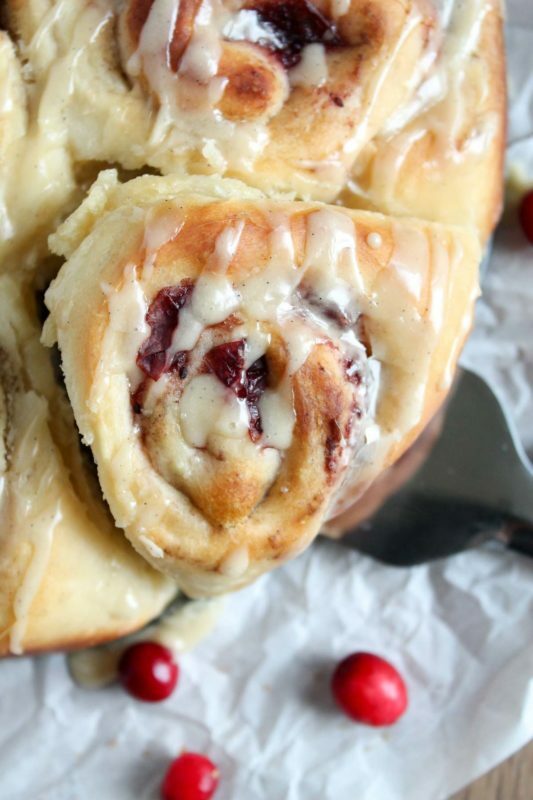 My normal cinnamon roll recipe has a cream cheese glaze, but I thought the tang of the cream cheese would compete with the tart cranberries, and we don’t want competition where cinnamon rolls are involved. 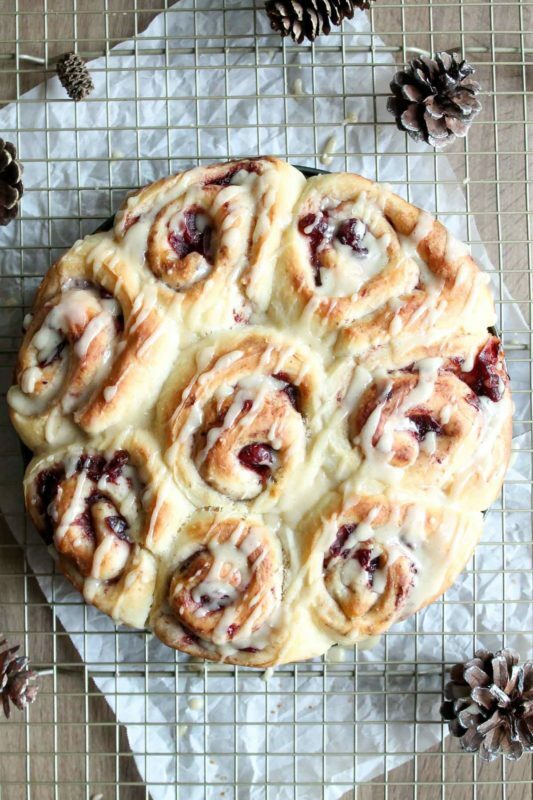 Or maybe we do…a cinnamon roll competition wouldn’t be the worst thing in the world to judge. Anyway, one of the better things about this recipe is that not only is it easy to make, you can also make it the night before and let it rise overnight! That way, you can make the dough while everyone is in a turkey coma tomorrow night, leave it in the fridge, and bake in the morning to pure delight. 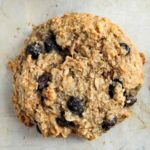 I tested it both ways, baking them immediately and baking them in the morning, and I found I liked the flavor of the dough even better when it sat overnight. The longer fermentation adds some complexity to the rolls that the immediately baked ones didn’t have – but trust me, I don’t think anyone will complain either way. If you want step by step instructions for how to make the cinnamon roll dough, roll it out, and shape it, see my original cinnamon roll recipe or my carrot cake cinnamon rolls. This is exactly the same process! The dough is made in a pot on the stove, and once it’s risen it is one of the easiest doughs ever to roll out. It barely sticks at all! By the way, I recommend a bench scraper to cut the dough into even rolls – so much easier than a knife. Trust me on this one. 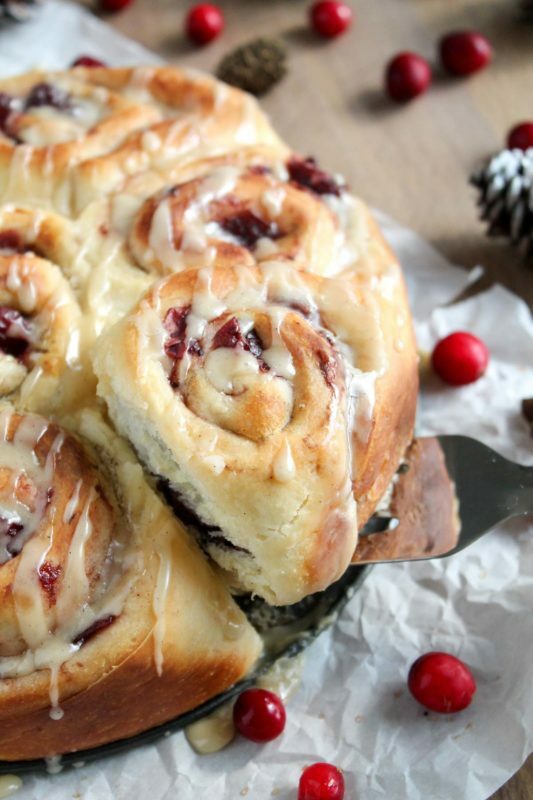 I hope you can make room for these cranberry breakfast rolls in your life this holiday weekend. I also hope that it is full of love, laughter, and wonderful food. Happy Thanksgiving my dears! Combine the milk, oil, and sugar in a large pot (I used a Dutch oven) and place over medium heat until just before boiling. Turn off the heat and let the mixture cool until just warm to the touch, about 105-110 degrees F.
Sprinkle the yeast over the top of the milk mixture and let sit for 1-2 minutes. Add 4 cups of the flour and stir with a wooden spoon until an evenly combined dough has formed. Cover and let sit on the stove (with the oven on if your kitchen is cold) to rise for about 1 hour. Check after 30 minutes to make sure it is rising. If it's not, your yeast might not be active and you may have to start over. By the end of the hour, it should have doubled in size and smell yeasty. Add the remaining 1/2 cup flour along with the baking powder, baking soda, and salt, and stir until completely combined. Divide the dough in half and roll one half out on a floured surface to about a 12x8 inch rectangle. Spread half the cranberry sauce (mixed with cornstarch if your sauce is liquidy) over the dough, leaving about an inch around the edges uncovered. Starting with the long edge farthest from you, roll the dough towards you, moving your fingers evenly back and forth along the dough, until it is tightly coiled with seam down. 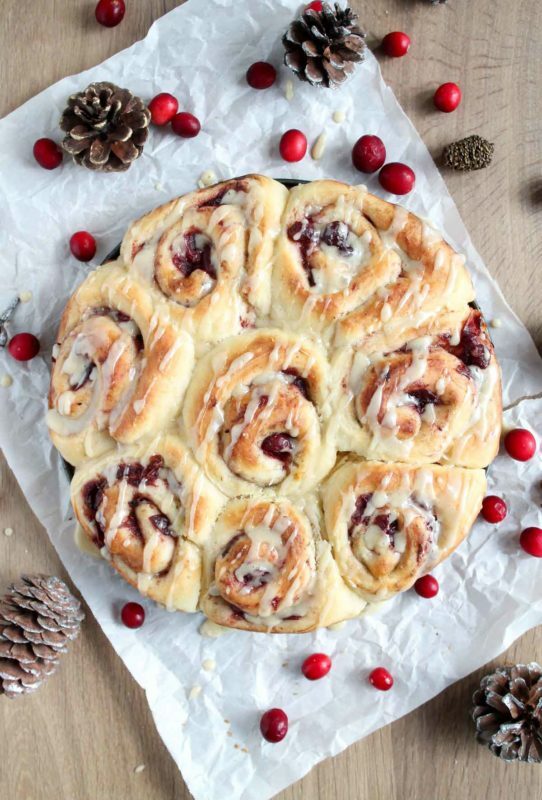 Cut into 8 even rolls with a bench scraper or sharp knife, and place in a greased pie plate or 9-inch round cake pan. Repeat steps 5 and 6 with the second half of the dough. Preheat oven to 375 degrees F. Let the rolls rest on top of the oven for 15-20 minutes, until slightly risen. Bake for 22-24 minutes, until golden brown. Make the glaze while the rolls are baking. Once the rolls are shaped and in the pans, cover with plastic wrap and place in the refrigerator overnight. In the morning, take the rolls out and allow them to sit at room temperature for 30 minutes while you preheat your oven to 375 degrees F. Bake for about 24-25 minutes, until golden brown. Make the glaze while the rolls are baking. Whisk together powdered sugar, vanilla paste or extract, and orange juice, 1 tablespoon at a time, until the mixture reaches a pourable, but still thick, consistency. 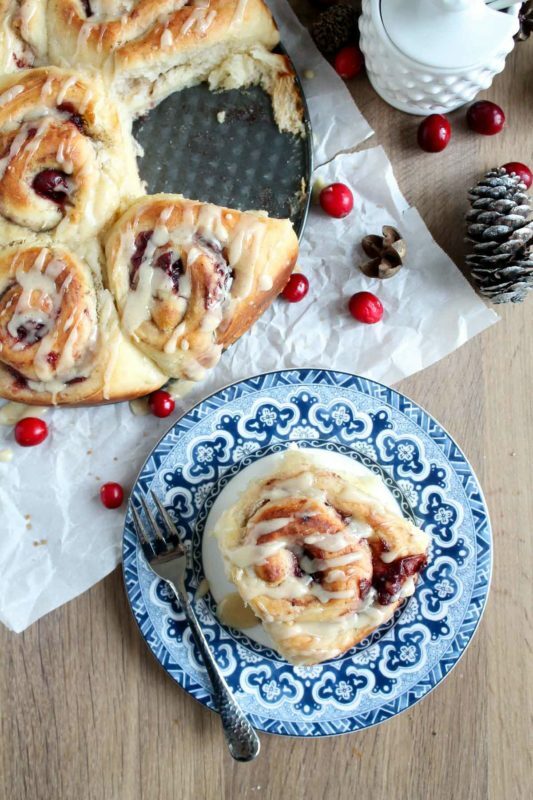 Pour the glaze evenly over the warm cinnamon rolls in the pan. Serve warm with coffee and lots of love and laughter! Store any leftovers (not likely) in the fridge for up to 5 days, and simply microwave for 20-30 seconds to reheat. Recipe adapted from my cinnamon rolls with cream cheese icing. I just made these. Part of the batch I did right away, and the other half 12 hours later. The second was vastly superior in flavor, texture, rise and crust, I’m sure in part because I used Red Star active dry yeast. I also sprinkled a few sliced almonds, which the dough easily supported. Outstanding overall. These are basically everything I dream of waking up to on Christmas morning. LOVE the cranberry in there too! Gosh, me too. 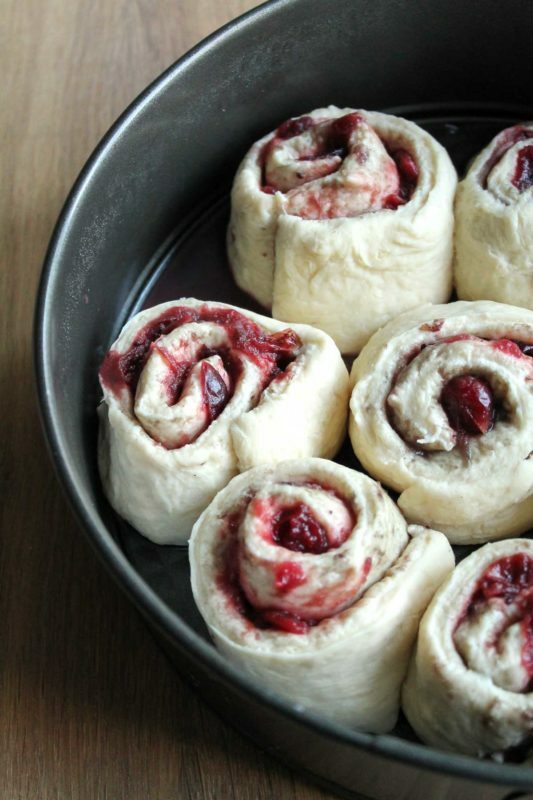 Cranberries and Christmas (and rolls) just go together!